from Sept. 18 to 22 in Pain Court and they are looking for people to help . 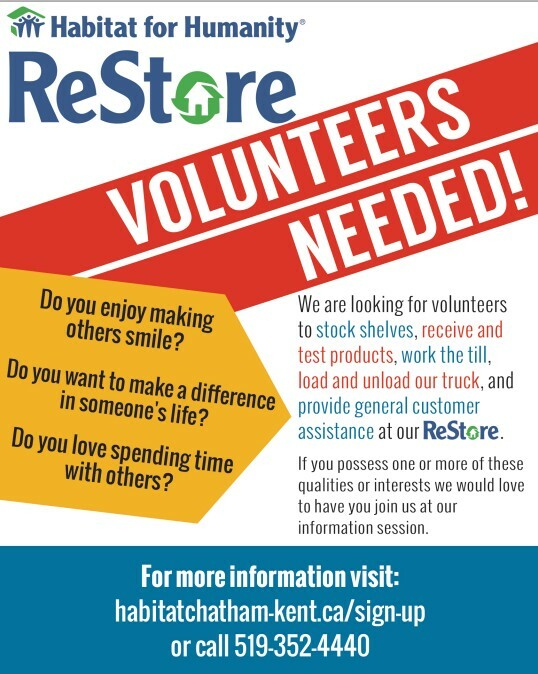 Volunteer training will be provided on Monday, Sept. 17 at 7:30 p.m. at the CLAC offices on Keil Dr. S.
Consider donating items to Habitat for Humanity at their retail store, including e-waste. Family Service Kent is in need of CHAP Volunteer Drivers. You are needed to drive seniors and people with disabilities to appointments, groceries, banking etc. in Chatham-Kent. A valid drivers licence, reliable vehicle, proof of insurance, current police check are required. Benefits are knowing you are contributing to the well-being of seniors, mileage reimbursed, you set your schedule, suitable for anyone of any age. For further information call 519-354-6221 ext. 241. Chatham-Kent has launched an Emergency Homeless Response Line. The phone number is 519-354-6628 and is available from 4:30 p.m. - 8:00 a.m. Monday to Friday and 24 hours on weekends and holidays. Chair of Faith Relations to the CK Hospice. If your church or any group in your church donates to the Hospice, please let Eric know as Kent Presbytery will march donations up to $10,000. Chatham-Kent Council will also match our donations up to $1.5 M. Contact Eric at southbuxtonpc@gmail.com. The Ridgetown Foodbank is in need of school snacks, cheese and crackers, puddings, granola bars, fruit juice boxes, canned meats, apples, oranges and potatoes. All donations are welcome. Chatham-Kent is in need of volunteers for Meals on Wheels. Drop them in the box on the stage. Or, take them to Home Depot or the Battery Boy. There is a bin near the checkout.